- The Greek name Eudyptula means "good little diver". - Although some biologists consider the white-flippered little penguin as a seperate species, most of them see them as a subspecies of the little penguins. - The species is regarded as the most primitive penguin species on the evolutionary scale and reminds on ancestors like puffins and petrels. Comparable to Spheniscus species, they breed in holes (burrows) as a defence against the sun and predators. - The group has a unique rhythm while they are nocturnal on land. They take a plunge early in the morning at sunrise and return not before sunset to feed and care for their chicks. to avoid the warmth of the day, while they are well protected against the cold water, but not so good against the sun. at twilight their prey swims closer to the water surface, so they don't have to dive very deep before returning ashore at sunset. - While they mainly breed on the Australian and New Zealand mainland, they aren't very popular with everyone. They dig in flowerbeds, or make their burrow under (especially wooden) houses. During courtship, they keep awake the inhabitants (nocturnal on land) by their calls and fights. And while feeding their chicks, some fish remains will cause a foul smell. Also sick or dead birds under a house can give off a stench and inconvenience. 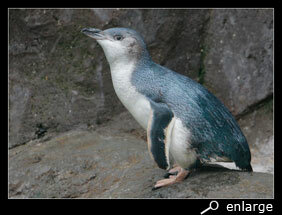 - The group belongs to the warm sea penguins, which means they live in moderate oceans. 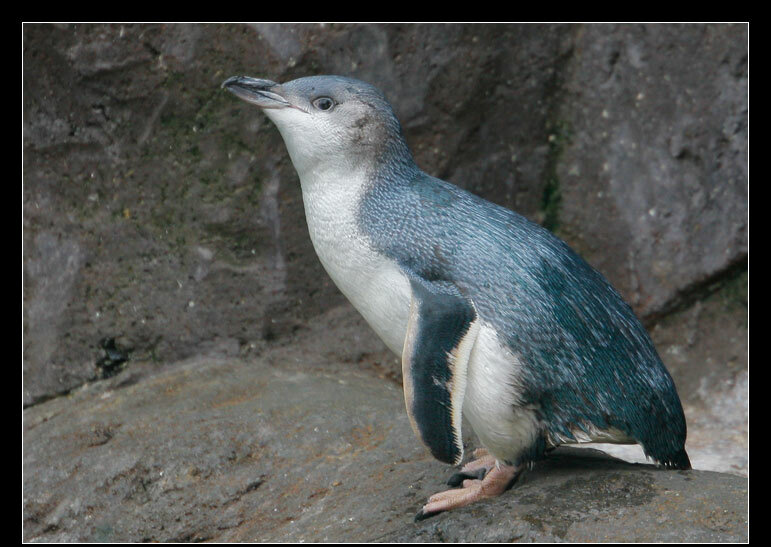 Smallest penguin species with blueish grey back, flippers and head and a white front. Six subspecies are recognized, but mostly they are divided in 2 groups: the normal little penguin and the white-flippered little penguin. The white-flippered is recognizable by the white line on the edge of the flipper and lighter colour. They are sedentary birds, which means they daily come ashore and stay close to their breeding grounds. Often pairs too stay together during the whole year. Little penguins measure 30 à 40 cm. They weight around 1 kg, with fluctuations of 200 gr during the year. A little difference is measurable between the sexes: the bill of the male is a bit thicker and larger. And he is slightly heavier than the female. The little penguin was described firstly by Reinhold Forster in 1781, who used the name "Aptenodytes minor". In 1856, Bonaparte introduced the scientific name "Eudyptula minor". 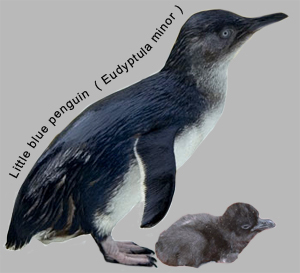 In English you have various names for the little penguin : going from "little blue penguin", "fairy penguin" to "blue penguin". The Maori name is "Korora" and the Aboriginals call him "Choolia", "indala" or "munuwar". Little penguins breed on the coast of South Australia and Tasmania just like in New Zealand and on several sub-Antarctic Islands southern of New Zealand. The total breeding population is unknown, but is estimated at less than 500 000 pairs. - brown : Chatman Islands eastern of New Zealand : Chatham Islands little penguin (E. m. chathamensis). - the other three are E. m. minor (pink stip southern of New Zealand) ; E. m. variabilis (dark blue) southern of the North Island of NZ; and E. m. iredalei (purple) around the northern part of the North Island of New Zealand. Little penguins dig out (0,5 m) deep burrows for their nest. For stability they choose preferably a place under the grass. Although no colony is made, they prefer to stay close to other pairs. Depending of the breeding place, the breeding season starts in March or in late April-May. The period of egg laying is long and flexible, between June and October with a peak in September. In good years even two clutches can be raised in one year. Normally two (sometimes even 3) eggs are laid and mostly both chicks will hatch and fledge. Incubation lasts 33 till 39 days, in alternating shifts of 1 à 3 days by both parents. When they hatch, chicks have a brown-grey down, which is replaced by a chocolate brown down on the back and a light grey down on the front after one week. Chicks are guarded during 30 days by one parent, while the other one feeds them. Crèches are sometimes made, but only in very small groups of up to 6 chicks. The chicks moult and fledge in March when they are 50 till 65 days (8 weeks) old. Chicks are fed at night (nocturnal!). 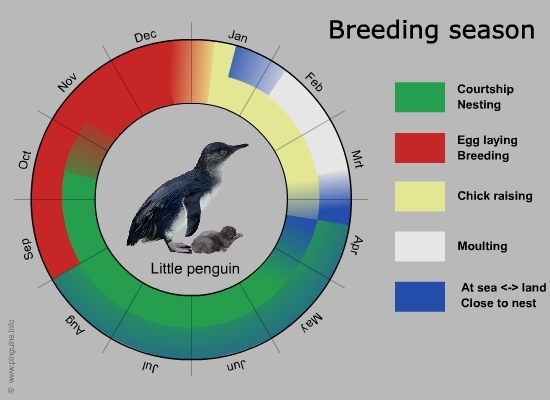 Little penguins are loyal for live and return every year to the same nest and partner. Although sedentary birds, some breeding pairs will stay in the neighbouring water from April till August or court ashore. Adult birds moult after the breeding season. The juveniles will breed for the first time after 3 years and return to the breeding ground where they have hatched before. 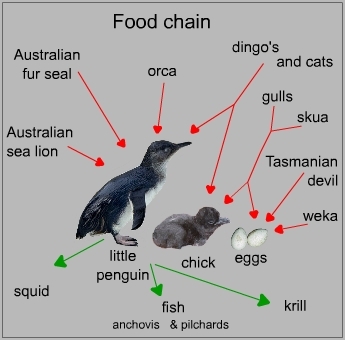 Little penguins eat mainly fish and squid, depending what they find first and where or when they forage. Sometimes krill is on the menu too. The fish is mostly anchovis and pilchards of maximum 5 cm. 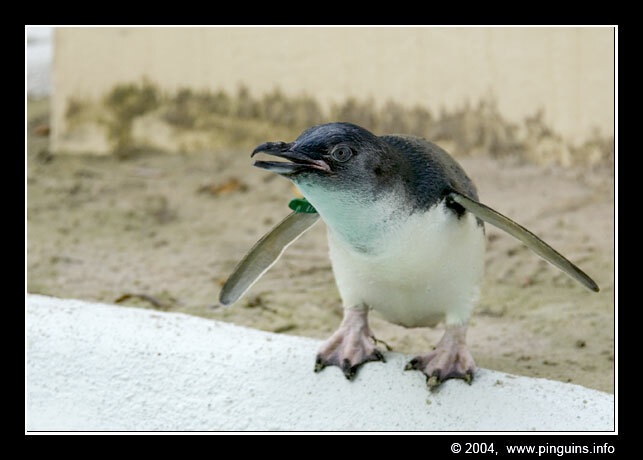 Little penguins fish alone or in small groups at a depth between 0 and 30 metre under the water surface. 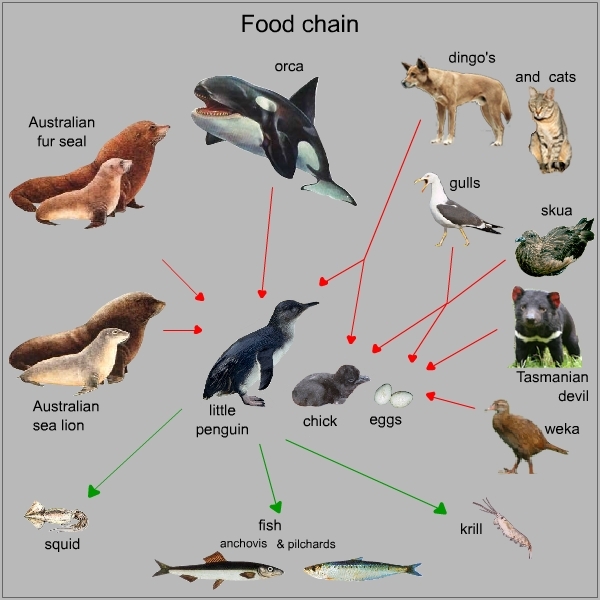 While little penguins mostly live on the mainland, they have a lot of enemies. Humans (seamen and inhabitants) have introduced several animals which don't belong there. Frequently roaming dogs and cats will kill the adult little penguins; mustelids like ferrets and weasels catch chicks and eggs are stolen by introduced rats and mustelids. Often birds will be run over by traffic. Moreover a lot of natural predators threaten little penguins and their chicks: skuas and other gulls, wekas, snakes and Tasmanian devils rob eggs or chicks from the nest. At sea adults and juveniles are prey to sea lions, fur seals, sharks and orcas. And although barracudas don't eat penguins, they can injure them deadly.